The safety and efficacy of your product rides heavily on the quality of the components that make it up. You need clear specifications and all parts must be tested, proven to be safe, then approved. Even with stringent guidelines in place though, most companies will find cases of nonconformances. This is a term that can be used broadly depending on your role in the organization. For this topic, we’re focusing on product nonconformance, which means that for some reason your product doesn’t meet specifications. You need parts or pieces for your device that you order from a supplier or manufacturer. Those parts come through your receiving system where it may be picked up that there is something amiss with the part. If it isn’t picked up there, you may have parts sitting on the shelf that don’t meet your specifications. Secondly, you may pick up nonconformance after manufacturing. It may be identified during your QC process, or after a product is shipped out to distributors. Basically, in any part of the process prior to the customer, there could be a nonconformance identified. Software. We often think of more tangible goods, but nonconformance can appear in software in the form of a bug. 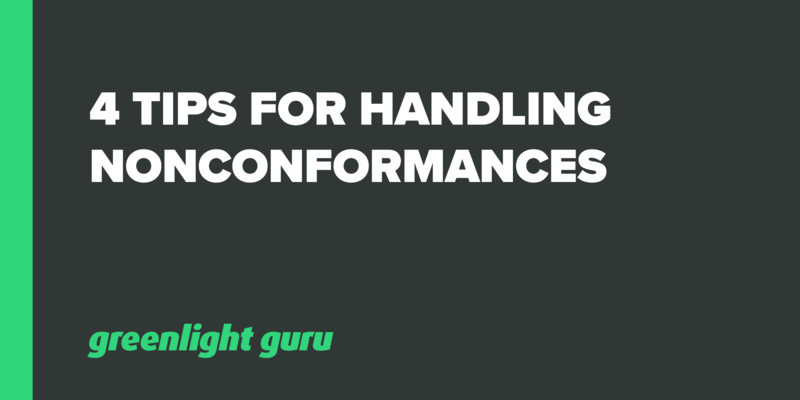 A nonconformance means it has been identified as an issue before it leaves your control. If it gets to the customer, then it’s a complaint rather than a nonconformance. A distributor may also identify a nonconformance, as they are not the final customer. Your suppliers play a critical role in the safety and efficacy of your product. You’re buying your parts, pieces, materials, firmware or software from a supplier. Even if you can’t touch and feel that firmware, there may be problems with it that can harm your circuit board. You rely on those suppliers sending you quality product, that means they need to be properly evaluated and qualified. This begins before you start receiving materials and may include a survey of critical elements to assess initial suitability. When it comes to the point of having chosen a supplier and receiving goods from them, it’s about managing and monitoring them well. Keep documentation to make this easier, for example, a chart or software like Greenlight Guru's that allows you to track orders and the number of nonconformances per supplier. You need good inspection criteria for each stage of the part’s journey; incoming, in-process and prior to shipping out. In our experience, the incoming piece is often where inspection activities can be improved. You don’t want to be checking parts in, putting them on the shelf and then discovering three steps later in the process that there is a problem. There are standards out there that you can apply to improve this process, such as those found with acceptance quality limit sampling plans. An important step is to define the critical dimensions of your inspection criteria. For example, you might have specifications for dimensions shown on your drawing - usually there will be two or three critical dimensions you can check very quickly to determine if the part is good. I once had a client who came back to me with 15 dimensions they’d identified as critical, but this is too many. Usually three to five will do. You need to be thorough about describing your manufacturing criteria and requirements. Nonconformances often occur where design transfer isn’t done well and there’s an almost “throw it at a wall” attitude. This mentality often means that when production gets it, they don’t understand what’s involved because they weren’t part of the conversation. A good job of design transfer helps prevent future nonconformances by informing manufacturing resources of what’s important about the product. Improve that knowledge transfer as this has been a big problem across the industry. You could scrap the part , component or product. Send the part back to the vendor. Use as-is. This is tricky - why is your specification something else if you’re willing to accept this? Should your specification be changed? Rework the product. This is also tricky - you need defined processes to describe the rework. Take the time to document them and make sure you have training and inspection criteria established. Track and trend any of these options that you use to discover patterns and help to find solutions. Any nonconformance should trigger an investigation process anyway. You need to document the occurrence, how you went about an investigation and any actions you took to remedy the situation. Occasionally, your nonconformance might move forward to trigger a CAPA, although remember that this isn’t always the case. It’s actually relatively rare for a nonconformance to escalate to a CAPA because usually, you can manage it through your regular nonconformance process. CAPA might be triggered when you see the same nonconformances repeatedly, which may indicate a systemic issue. This further highlights the importance of tracking and trending your nonconformances - more work needs to be done to identify root causes if your regular process is not remedying the nonconformance. As an example, perhaps you find that a certain part keeps breaking during the manufacturing process. The part comes from a supplier and you opt to send parts back to them. When the same problem keeps occurring you trigger a CAPA and initiate an investigation into root cause. Perhaps you find that the wrong alloy was used in creating the part so it is not strong enough for your purposes. You would then examine the specifications that the supplier has to ensure they are correct and would work with them to ensure that you’re getting correctly made parts. Free On-Demand Webinar: How to Avoid & Respond to FDA 483's and Warning Letters. For most medical device manufacturers, or indeed manufacturers of any sort, nonconformances will be part of life at some point. They are most often associated with parts or components that don’t meet specifications, but they can also involve less tangible elements, such as firmware or software. Whatever the case, a foundation of good supplier management is an important piece in managing nonconformances. You need to screen thoroughly, then monitor frequently to ensure standards are met. Tracking and trending will be a key part of good nonconformance management. Monitor trends, investigate thoroughly and document all of your actions.